I am still moving slowly on my XO Computer but I am intrigued by this concept of the “Mesh Network” system, which builds wireless “clouds” between XO users. This means that not only can XO laptops connect with each other but as long as one XO in a mesh has connection to the Internet, then every XO in that mesh has the same access. This has interesting ramifications for classrooms where wireless connections may be few and far between. And, even if there is no wireless access, the mesh allows XOs to connect with each other anyway, and share resources and collaborate on projects together. The software “creates” a virtual wireless network for the classroom. Isn’t that cool? This video does a better job explaining it than I ever could do. And this is interesting, too — looking at the XO as an e-Reader and considering ways to get books to children of the world. I am sitting in the Starbucks in downtown Northampton, a place I almost never visit because of the high cost of a cup of Java. There are cooler places just a few doors down. But I am writing this post on my XO (known in my house as the Green Machine) to see how easy it is to post to the blog. The XO is connected to the Web via a free Hotspot account through T-Mobile that is available to XO owners (for a year) and the hub is here at Starbucks. I connected with incredible speed (faster than my Dell laptop) and I was browsing in seconds. I am curious to see if anyone asks me about the XO as I sit here at a community table. So far, I have gotten a few curious looks but that is about it. OK — this tiny keyboard is killing me — I keep making mistakes and moving back and forth with my text. I am a fast typist so the slow progress is frustrating the connection between fingers and brain. This morning, I was at home with the XO open and one of my sons was incredibly interested in what I was doing, so we opened up the TamTam program and played a little music. (You use part of the laptop keyboard as a virtual piano keyboard). One of my first goals is to learn the various TamTam programs and compose and record a little piece of music. I realize that I need to take this thing apart (not literally, of course) one program at a time. Music seems like a good place to start. For now, in Starbucks this morning, I am going to use the XO as an e-Reader for some draft chapters for the book I am co-editing on technology and writing and assessment in the classroom. I have the files on a flash drive and in Google Docs, and I want to try both options for reading. By the way, one of the things I already love about this machine is its portability — it is light, easy to carry and colorful. My wife and I invited a few teacher-friends over to our house last night to watch a DVD of the movie, Chalk, which has been sitting on our counter for about five weeks now. This low-budget flick is in the great tradition of Spinal Tap, Waiting for Guffman, Best in Show, and others that shine a humorous light on some aspect of society (rock band, theater group, dog shows, teachers) while also bringing to the surface some truths about those worlds. The director, Mike Akel, was a teacher and gets inside the school in a way that you don’t see in many of the heart-breaking, heart-warming movies about education. 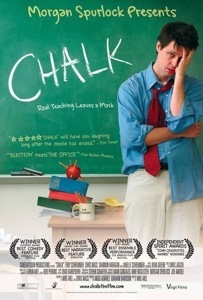 Chalk examines the lives of some young teachers at the start of their career in an urban city school as they stumble, mumble and groan, try to engage their students, plot their way to winning a teaching award, and just make it from day to day with their sanity intact. The main character — Mr. Lowrey — is a former computer geekwho took two aptitude tests that told him that teaching would be a good fit and here he is, losing complete control of his classroom. Other characters include the pushy PE teacher yearning for some personal life, a teacher-turned-administrator who now only interacts with the behavioral problem students and misses the classroom, and a third-year teacher who wants to be Teacher of the Year more than anything. My friends and I were laughing through most of it as we saw ourselves, and our colleagues, in the characters and situations. One sequence that we enjoyed was a twist on the Spelling Bee, called a Spelling Hornet, in which teachers took park in an event where they had to correctly spell various slang words used commonly by their students. The nerdy, nervous teacher wins, but only after getting some real education from his students. (And later, he kicks out a little rap rhyme for the class after being urged on by his kids). Chalk is worth the rental and bring over a few teacher friends and have a party, and be glad that your first year of teaching is behind you. A few weeks ago (probably as he was compiling his web-famous Top Ten Lists), Larry suggested that I go through our Day in a Sentence archives and cull out some of the better sentences for an End of Year Review. That’s more difficult than it sounds. There were so many good sentences and who am I to judge the quality of the sentences or the stories behind the words? As I went through the many wonderful sentences and read them aloud to myself, I was searching for that tingle inside of me that meant the words had touched me emotionally. I recognized that some of these same sentences were still very familiar to me, even after a few months time. (I also did not choose any of my own sentences). There really are some wonderful, reflective writers out there and I am thankful they send their words my way (or the way of our guest hosts) every week. Yesterday, I wrote about my investigation into video, particularly as it pertains to sharing and showcasing student work with families via the Web. (In this most recent case, it is puppets. 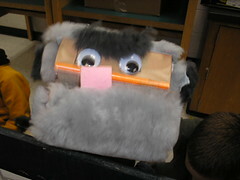 But later in the year, it will be claymation and animation and other projects). The following website is the result of that exploration. I would appreciate any feedback you may have, since I have only been able to view it from my home desktop computer. Just over a year ago, I decided to try to move deeper into the convergence of video and the web (see the Collaborative ABC Project for one aspect of that investigation). When doing class projects with students, I have often burned the videos onto DVD (time-consuming when you have 80 students) and worked to share them via our class websites and weblogs (yes, we have a school website and two different blogs — one for daily homework assignments and one for showcasing work from my writing class). In doing so, I have relied on either YouTube (although almost never) and GoogleVideo (more commonly) or TeacherTube (sporadically). My concern is always the links that bring my students eyeballs to inappropriate places. (With TeacherTube, it is has been a frustration with the buffering time). So, after filming 24 different puppet shows last week and wanting to share the videos with both students (they never get to see their own shows as they are behind the puppet theater) and their families, I decided that I wanted to find a way to host the videos and stream them myself. This way, I have complete control. It hasn’t been easy, partly due to my own lack of knowledge about web hosting and video conversion, etc. But I think my perseverance has paid off. First, I took videos of the 24 puppets shows on my digital camcorder, and then used MovieMaker to create small versions with titles. But the files are still huge and really not in any state to embed in websites. One thing you learn quickly about video is how huge the files are going to be if you want any sort of quality. So, I posted a query to the Classroom 2.0 Ning Community, asking about advice, and some folks were very helpful. It was here that I began to realize that I needed to convert my movie files into a flash or Shockwave format. This makes for better streaming. I experimented with YouConvertIt and it worked but it was slow. So I bought a video conversion program called SoThink video encoder, which is very flexible and allows for converting videos to different kinds of formats. Thus began much experimenting about size of files to be created and formats. I went through a whole process of creating flash movies before I realized that shockwave is better for streaming (I am trying to cut back on the buffering as much as possible). After converting all of the files to a SWF format (shockwave), I then thought about how to host the files. At Classroom 2.0, some folks suggested using my school server (not an option for me for both space reasons and for access reasons). I tinkered with using my Box.Net account, where I host my podcasts and store important files as a backup, and that worked but it ate up a lot of my alloted space. So I turned to a video hosting site called 4Shared Video and paid for a Silver account that allows you to embed video that you have in your account. So, after many hours of uploading the videos, I now had to figure out how to embed the files. I used Google Search and came upon a site called (ahem) Free Video Codes that will generate html code for embedding video files being hosted elsewhere. It was very handy and easy to use. So now I had my videos stored somewhere, and I had the code to embed, and now what? I needed a way to showcase the movies. I tried out a variety of different things. I embedded some of the videos into my school homepage but found the buffering of multiple videos just too much. Someone at Classroom 2.0 suggested using my Wikispaces site, and I did try that but found it wasn’t what I wanted. Once again, I turned to Google again. If you have a gmail account, you have access to something to Google Page Creator, which allows you to create websites under the Google umbrella. I realized that the site now allows you to set up multiple domains, which is nice since I could not establish a website just for the puppet shows. I then created a title page, with links to an individual page for each movie. So the entire site is now 25 pages. 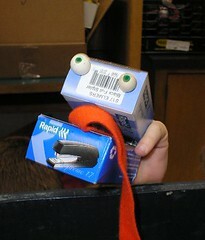 I know some students and families are going to want a copy of the puppet show videos, and I am in no mood to burn DVDs. So, what I did now was uploaded the video files into my Box.Net account, made a download link, and placed that link below each of the movies on the websites. Now kids and families can watch the movies on the web and download their own versions. 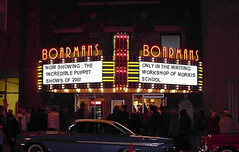 Tomorrow, I will share the actual Puppet Play Website. I suppose that is enough informationfor now, but I hope it will help others who may be thinking along the same lines as me and want to know a path to showcasing student videos without the use of a hosting source. (Of course, you could just use YouTube or GoogleVid or TeacherTube and make things easier for yourself). I am going to write more about this later this week but I have been on a self-exploratory mission to learn more about embedding video without the use of Google or YouTube or TeacherTube, etc. It has to do with showcasing puppet shows for families and not wanting to have any external links, and fast buffering (we have wireless in our school and if I have 20 students viewing puppet shows, I need a quick buffer). 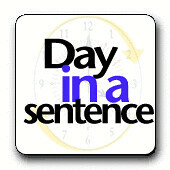 It’s started out as another slow week here at the Day in a Sentence front office. I was thinking the writers were on strike, just like in Hollywood, or maybe they were just taking a well-deserved break from the action. Then, the words came pouring in and my bin was overflowing with treats. In any event, I want to wish everyone a peaceful holiday (if you are on one) and a wonderful New Year. First up is my friend, Joe, who has just joined me and some others in the Youth Radio network and he posted some of his students’ personal narratives this weekend. Joe had a bit of a pleasant surprise this week: “Contemporary medicine said it wasn’t possible, but mother nature proved them wrong: my wife is expecting.” (Big huge congrats to you and your wife, Joe). A few months ago, I decided to parlay some workshop stipends into supporting the One Laptop Per Child movement by buying one of their new XO laptops (and then they send the second one that comes as part of the purchase to a child in a developing country). Part of it was wanting to support the effort and part of it was wondering what these machines were like, as they surely are the first step towards cheap and durable computers for children around the world. Yesterday, the XO arrived in a small package and in about five minutes, my three year old son and I were taking pictures of ourselves, videos of us being goofy and audio of us singing. There are no instructions (I have to go online to get some more details about using the laptop) but it seemed pretty easy to use. The drawback is that it is slow (not much RAM, I guess) and the keyboard and screen are small. I’ll have to delve in a bit more over holiday break. Over at the OLPC wiki site, you can see how many programs come with the machine and how many are being developed for the future. Very cool. PS — here is a cool little video from the perspective of a child explaining the XO. Larry did an outstanding job with the Day in the Sentence feature last week and I want to invite you all to join the growing community of contributors. And thanks to Cheryl for the mention at the TechLearning site, too. I encourage you to podcast your sentence — either provide a link to your own podcast hosting site or you can email your mp3 file to me at dogtrax(at)gmail(dot)com if you want. I entered the delicate art of negotiations with 11 year olds this week as I tried to make them understand that a puppet play for little kids should probably not have references to Brittany Spears coming out of rehab nor should the play have characters being sent off to a “special needs facility” as some kind of punishment nor should we celebrate the life of “gangsters,” and I once again realized how much my students are caught up in the collision of pop culture and media overload.